Allures and Garcia Yachts http://www.garcia-yachting.com/ were well represented at this year’s Annapolis Sailboat Show. With the Allures 39.9 and the Garcia Exploration 45. In this review I will be discussing the Exploration 45 built by Garcia Yachts. Also known as Jimmy Cornell’s New Boat. 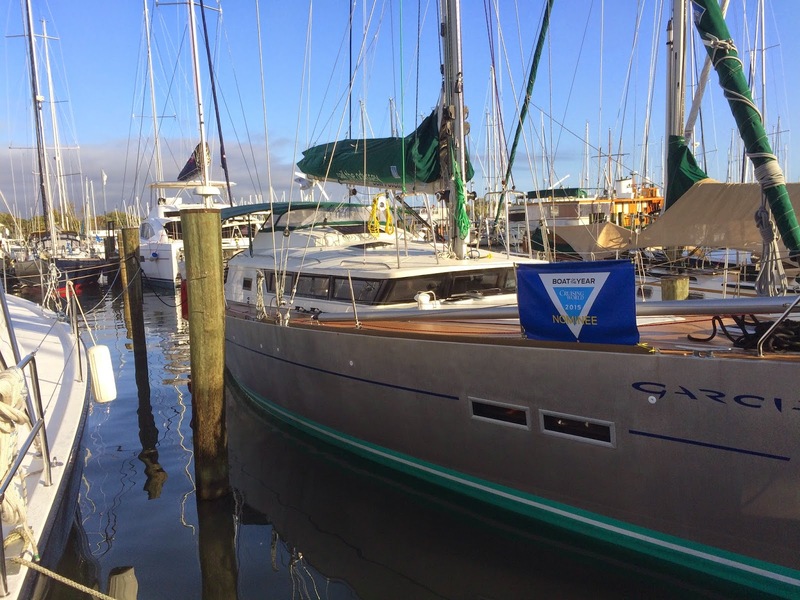 The Exploration 45 was designed with the input of veteran sailor, voyager, and cruiser Jimmy Cornell. The design comes from the board of Berret Racoupeau Yacht Design. 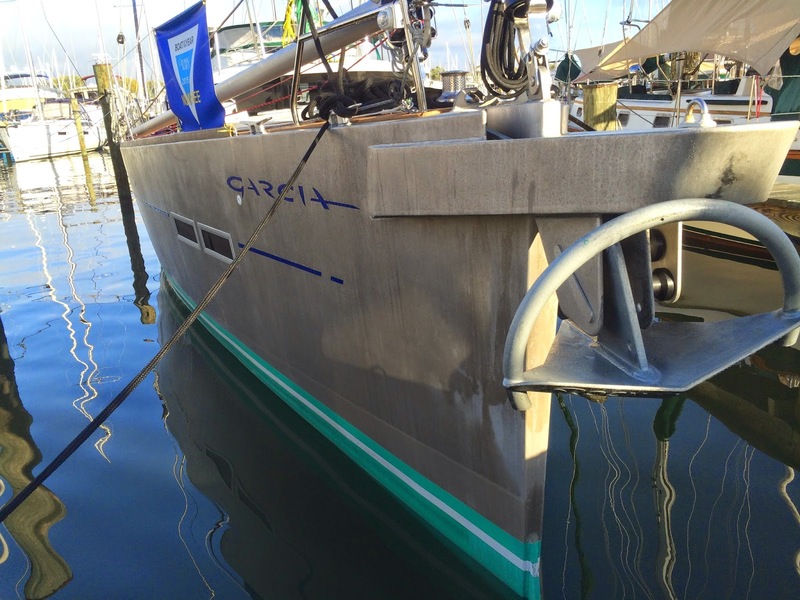 Even though this is a new design, and something I have not seen before, it does have something in common with other Garcias and the Allures Yachts a centerboard with twin rudders. This design makes for a very efficient sailing design because one rudder is alway vertical under sail. At slow motoring speeds having the twin rudders without the benefit of prop wash can make this type of design difficult to maneuver. The Expedition 45 solves this problem with the installation of a bow thruster. I was impressed with how well the boat maneuvered in the tight confines of the marina. With a draft of 3.44′ with the board up and 9.14′ board down shallow water cruising opens up a new world not usually visited by monohulls. With the board down windward performance is better than you would think of a centerboard yacht. As with all boats this design is a compromise of shallow draft and windward preference. It is a compromise I can live with! 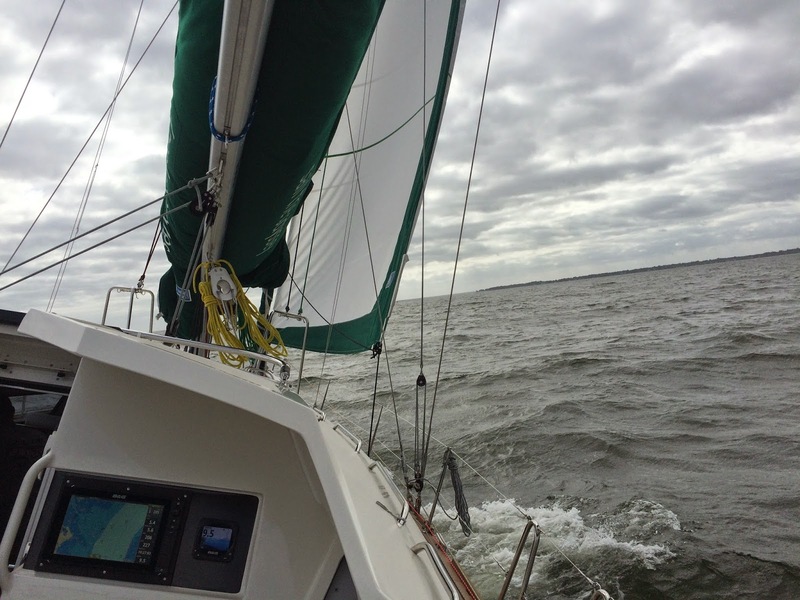 In our sail off of Annapolis, Maryland in 15-20 knots of wind we obtained speeds of 7-9 knots. The Exploration 45 handled well, which was to be expected of the design. In the afternoon the wind continued to increase and we decided to put a reef in the main. The process went with out a hitch. Over all, sailing this boat should be very easy for a couple. One of the most impressive features of the Exploration 45 is the navigation station. The navigation station is located in the forward saloon. This allows great visibility out of the house windows. I was impressed in the fact I was able to see over the bow from this position. 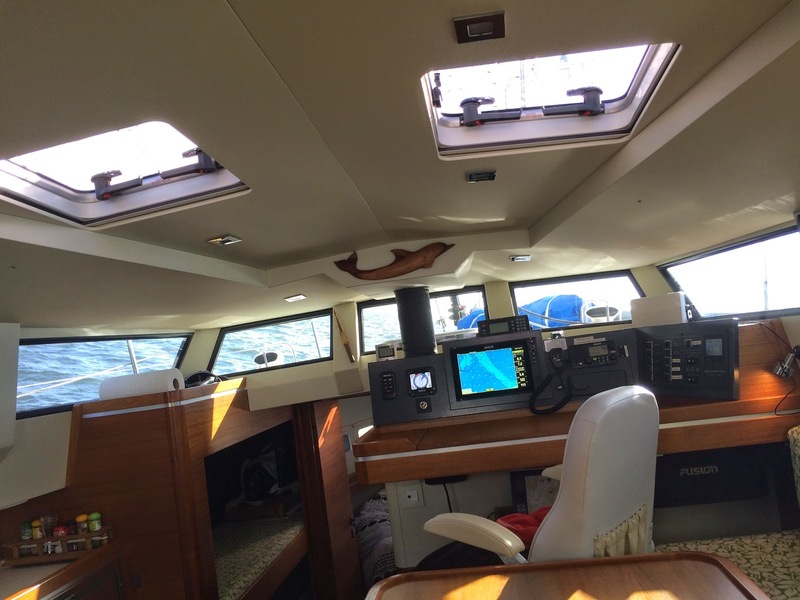 The interior was easy to navigate underway and comfortable. My only complaint is the limited access of the engine which is below the sole at the companion way which could make servicing the engine underway difficult. I found the filters and strainers were easy to access. The cockpit felt safe and comfortable. For the watch there is a safe place to sit behind the house with the chartplotter/radar within easy reach. What about the construction? I took a very close look at the construction of this yacht. 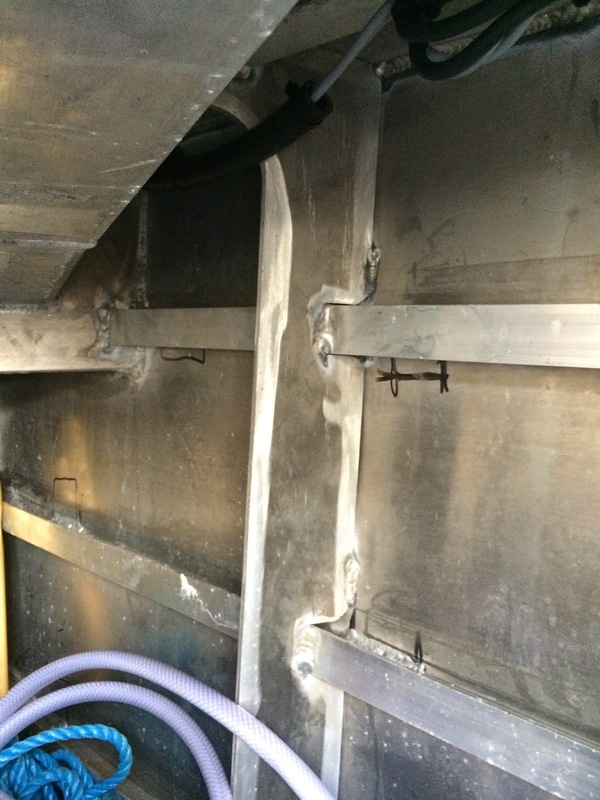 I am thankful that the Builder and Swiftsure yachts allowed me access to the bilge and systems areas of the boat. I was very impressed with what I could see. The metal work stands out on Exploration 45. The hull is fair, the welds are well executed, and the hull to deck edge is beautifully done. The cabin top is made from fiberglass composite. The aluminum decks are covered with cork decking to give the appearance of a teak deck. The footing of this deck is very good and it feels good on the knees. I would very much enjoy finding myself hundreds of miles offshore, watching the miles tick by on an Exploration 45. I hope to see more aluminum boats on the water here in the states. I look forward to when these yachts are on the used boat market and I find myself surveying one.